The big issue 50 hits hard. This is the culmination of the entire series up until now. It comes down to the two timelines from the feudal Japan and the present with the characters. What a massive undertaking, the issue is double-sized and features a multitude of a cast. There's the we lose Metal Head, Donatello returns, the Foot are taken under new management. Many threads of storyline come together into one Gordian Knot and are deftly sliced by the creative team to end old ones and at the same time create a new path to go down. This issue primarily deals with the relationship between the Shredder and Splinter. Through the parallel stories we get a sense that Shredder may be able to be redeemed, and the Splinter wasn't always the master of calmness. And the way it urns out in the end is both horrifying and wonderful. The Shredder is offered a way out through Seppuku and takes it, Splinter ends it honorably as his kaishakunin. The Foot is now under Splinter's control. The way this was handled was beautiful, it offered both parties a way to change their reincarnated fates to something new. Which also ties in to the possibility of the Krang being the ones to be interfering, or causing it, with the reincarnation through the DNA sampling from the feudal Japan era. By the end we find that this is a huge turning point for the whole direction of the book. Besides Splinter becoming the father to the Foot a ton of other things change. 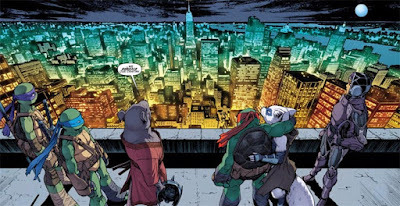 Karai heads off to Japan, Michelangelo leaves his brothers after seeing what Splinter did, Leatherhead is becoming more than just muscle with Fugitoid, Alopex might be led into darkness by Kitsune, and things are generally looking bleak and somehow hopeful at the same time. Exciting times are coming. Now for the sad news, it's been said that the amazing and very cinematic art by Mateus Santolouco will be leaving. His style was a tremendous driving force behind how great some of these past 50 issues have been. When the writing was questionable, at least the art maintained a high quality. It'll be sad to see his work go. And so I don't leave people out, the panels showing the past were drawn by Cory Smith, who also did a great job. 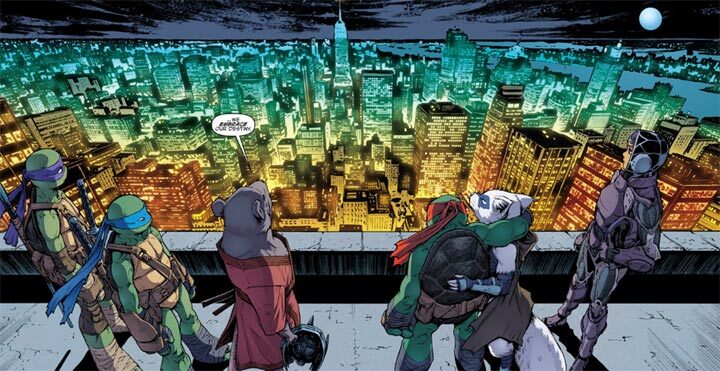 Tom Waltz did very well with the script, with help from TMNT creator Kevin Eastman and Bobby Curnow, Ronda Pattison's colors were top-notch, and we can't forget letter-er Shawn Lee's work. Well done all of you on this issue, it was quite a feat in both ending and tying up stories while making a whole new batch of things for all of us readers to look forward to..